Harlem's legendary Disco label Queen Constance has long been a cult favourite among fans of underground dance music for decades. One of many labels operating under the equally legendary P&P family of imprints Queen Constance was operated by one Peter Brown, a truly colossal figure in NYC's music scene, it's catalogue still fascinates music lovers to this day. Covering a wide range of styles including Gospel, early Rap and Disco the label's output continually finds it way into the playlists of respected DJ's and selectors across the globe. 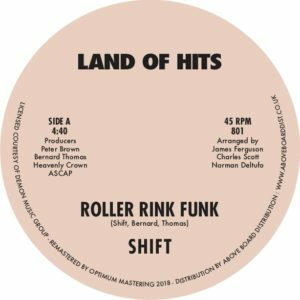 The mighty 'Roller Rink Funk' by Shift is the next reissue from the archives and never has a jam been more aptly named! Another class act from the plethora of uptown groups that were associated with Queen Constance and her orbiting planets, Shift was possibly yet another 'studio' group put together for this one time release. The co-production nous and involvement of long-time associate Bernard Thomas lends these cuts some serious B-boy credentials. Thomas was involved in a lot of the P&P era early Rap material, as well as working with BDP and lending his skills to releases on the cult Rap label Zakia too. Needless to say, this particular release is that magic funky frisson between Disco, Funk and the earliest stirrings of Hip-Hop, an especially rich vein of music. 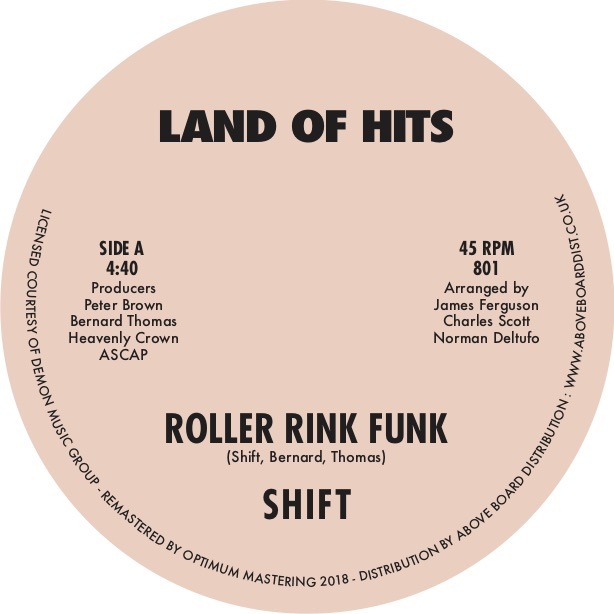 As the title suggests this one is meant to be heard at the roller rink, the syncopated rhythms mimicking the skaters movements and repetitions. As with any good roller-skating Funk record (there are many!) it doesn't take long for you to want to hit the dance-floor, whether it's to skate or to simply get down. An often tricky record to find in it's OG state, commanding 'collectors' prices, 'Roller Rink Funk' is back on the block for all the Disco freaks for 2018. Perfect.